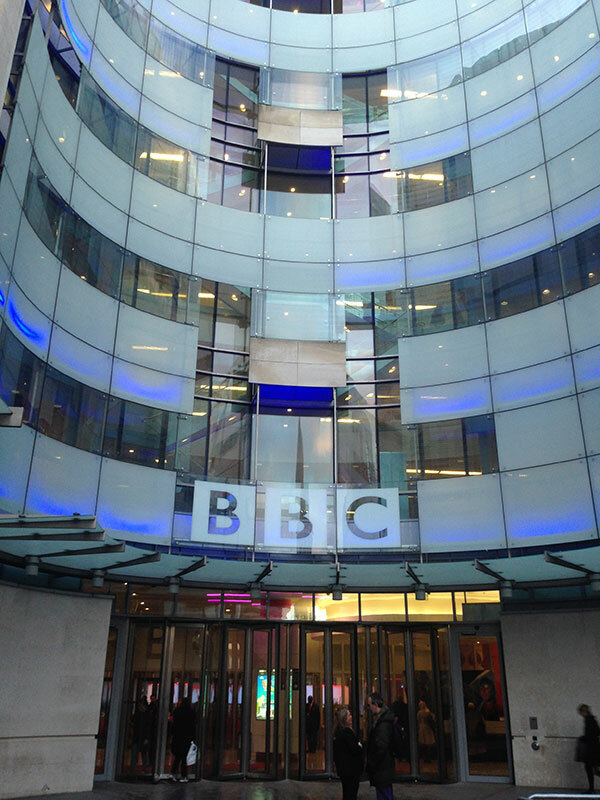 Second year student, Silvia, recently visited the BBC headquaters at Portland Place to find out about the BBC Production Trainee Scheme. One thing I have discovered in my year and a half studying at City University London is that London always offers new opportunities for you to seize, most of which are right on your doorstep, and completely for free. I’ve thrown myself into London life and had some great experiences. Visiting the BBC headquarters was by far one of the best. Walking across the massive buildings soaring over Portland Place, with a tag saying “BBC”, and my name pinned to my chest; chatting with broadcast journalists and hearing precious pieces of advice from them - all of this firsthand, from the inside – was such a great opporunity. The headquarters of the BBC are located in the heart of central London, just a few steps from the hectic Oxford Street. A shiny, glass-made wing connects the new buildings with the old ones, a bright colorful architecture opening on an external piazza taking up the centre of the complex. Being for most part made of glass means visitors on the outside are offered a view directly over the newsrooms and multimedia studios, while wide-screen TV and multiple screens throughout the main entrance report the happenings of the major BBC channels and media outlets. Can you imagine working there? As a journalism enthusiast myself, I could not help but be wowed. However, mine was not just a leisure visit. I was in fact there to attend the ‘Get in’ Event for the BBC Production Trainee Scheme, a programme they run on a yearly basis which attracts hundreds of applications. Those applicants who succeed in the selection process will be given the chance to actively get involved with the BBC, and provided with a whole host of training and experiences in online, print and broadcast. Not to mention that all of this comes with the benefit of being mentored by a professional BBC journalist. For a recent graduate wanting to break into media or broadcasting production, getting in is a life-changing opportunity - but, understandably, competition is, at the same time, really tough. Hence, getting a heads up on the application and selection process from both some recent successful applicants, some of the BBC journalists and the schemes' recruiters, while also having a taste of what working at the BBC looks like, can make you and your application stand out from the crowd. The activity I benefited most from was the production pitch exercise. For that, they split us into groups of four and asked us to interview each other, to spot some interesting fact, story or experience in those conversations to be turned into a pitch for a new programme. Then, from there, we were to construct the main idea, the genre, the slot, think of a possible audience and platform and ultimately give the programme a name and a slogan - to pitch it to the journalists in the room and hear back from them. The time I spent at the BBC gave me a sample of what broadcast production involves - of the range of activities going on behind the glossy veneer. One might think the anchor and reporters are the driving force of a successful programme; yet, after that day, I can say it is in the production room, behind the scenes, that the hard work - and also a lot of fun! - happens. And, although the BBC newsrooms might still be, for me, a few years away, this experience and all the other great opportunites that London and City University provide are helping me to get ever closer to that dream job.